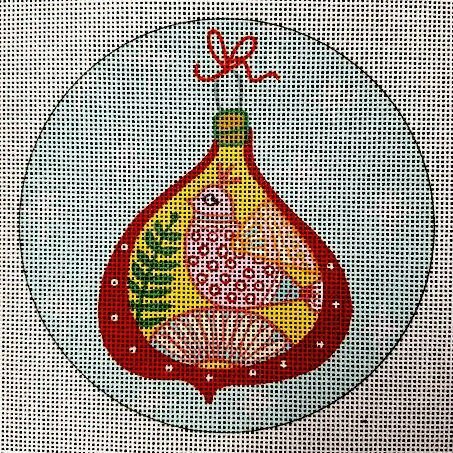 A color-printed folk art partridge needlepoint ornament. The design is color-printed onto 18 mesh mono Zweigart needlepoint canvas and measures 5" in diameter. You can purchase this needlepoint ornament canvas with or without fibers. If you select cotton we will send DMC cotton floss. If you select wool we use Bella Lusso wool yarns; for silks we use Planet Earth Pepperpot Silks which are single ply for 18 mesh canvas. This canvas usually ships within 7 days. If there is likely to be a delay we will notify you.